I am finishing up the car and im by not stretch a wiring person. Is this just a street car or will there be track/racing in its future? I'm not convinced there's a need for more than a single main fuse, but I'd be really interested on hearing differing opinions from some of the very knowledgeable guys around here. I’ve done a ton of research on this and from what I can tell the best way is to cut the lack/blue wire from the x-03 ( ignition switch plus) and run this direct to the starter w 10ga wire... sound right? This will also delete the security relay and clutch switch which I am OK with. I would personally keep the clutch interlock but you don't have to. The ignition can go straight to the starter solenoid without issue. I have mine running through a relay controlled by the alarm for some security. Plus a few other security gems I have hidden. I generally bypass the clutch interlock because I've had them fail on me and piss me off. If you want to fuse the main lead, put a big f$&ker on it, like 400-500 amps, near the battery. That's there to prevent your car burning to the ground, nothing else. I'd rather do a Mega fuse then a circuit breaker. 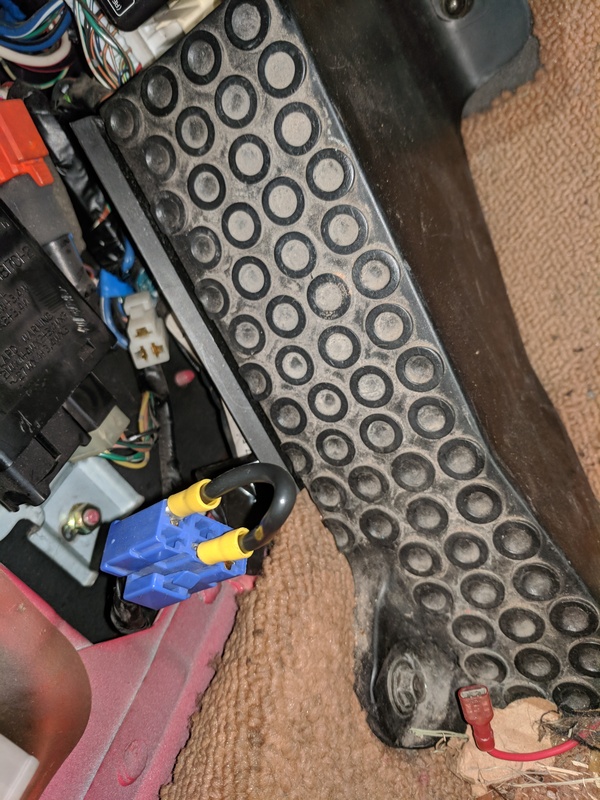 If you're worried about it, put a buss bar and a couple spare fuses in the glovebox, then if you blow it (and it's not a "valid" blow) you can replace it or bus bar it to get home. I'm with Blake. Get rid of the clutch switch. Another benefit is you don't have to put pressure on the thrust bearing when cranking the motor, before oil flow is established. Just make sure you're in neutral. Also, you only need one large wire (#2awg or so) from the battery to the starter. You can run #8awg or #6awg from the alternator output to the starter, and to feed the main distribution fusebox. Also should I tap into the the plug side by the ignition right? Not the harness side? FWIW, instead of using the wire from the key switch directly to the starter solenoid, I like to use this wire to trigger a relay that, in turn, provides power to the starter solenoid. 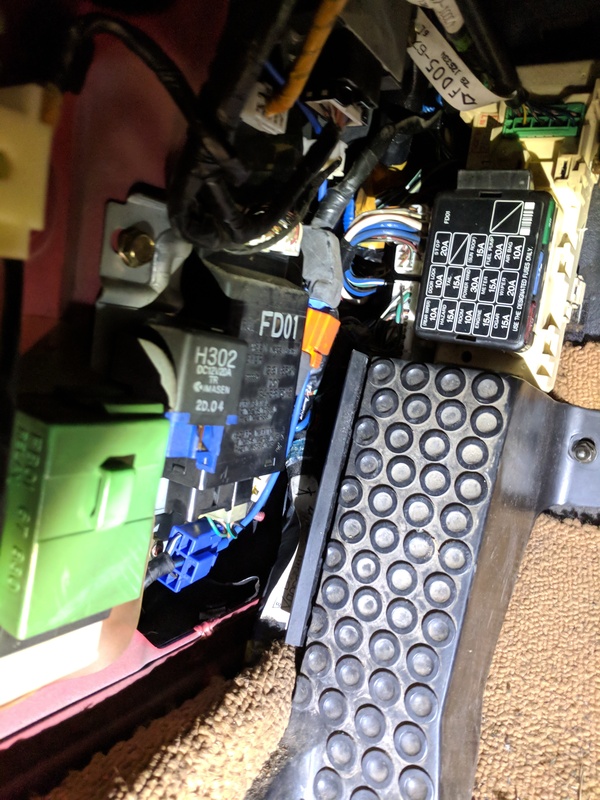 The solenoid can draw upwards of 30 amps, and if the key switch is getting a bit old and crusty, you can end up with the dreaded "click-click" when hot starting. A Bosch 30 amp relay works well and is cheap and readily available. Also, since the current to trigger the relay is small, the stress on the clutch interlock switch, should you decide to keep it, is reduced a bunch. The diagram you need is on page Z-24. BTW this diagram is shown in the "General tech how-to guides" on the NoRotors site. It looks like the easiest way to trigger the relay is to break into the Black/Red wire at connector X-11. If you want to bypass the clutch safety switch, put a jumper wire in the A1-04 connector. Please note: I've never worked on an FD, I have an FC, I'm just going by what I see in the wiring diagram. FD experts may want to chime in here. Still having a headache with this, so I can go direct from the X-11 black/red to the starter? Or do I absolutely need a relay? No, theoretically, you don't need a relay as long as the starter cut relay (if you still have it), the clutch safety switch, the ignition switch, and all the connectors between the ignition switch and the starter solenoid are in really good, clean condition with no corrosion. Can you be really sure of that on your 25 year old car? Keep in mind the GM solenoids typically draw more current than the oem Mazda ones, putting even more stress on all those components / connectors. I had a lot of starting problems with my swap and after replacing the starter and the ignition switch I ended up just running a wire directly from the starter solenoid to the plug for the security system where I previously had a jumper. Car starts on first crank every time I turn the key now.